Mum's sister, my Aunt Evelyn, passed away yesterday. She had been ill for some time and was only in her late 50's. I think she is 18 years younger than Mum - that would make her 56. She emigrated to Canada from Ireland as a small child in the 1950's. 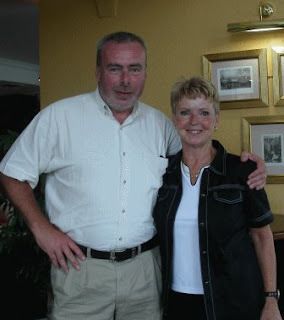 She last visited with us in August 2004. Kathleen hosted a party for Mum's 70th birthday (and Claire's 16th) in Kells which Evelyn attended. We also had Sunday lunch in Lawless's Hotel in Aughrim the Sunday before. The photo to the left of Evelyn and me was taken in the lobby of the Hotel. Evelyn stayed with us in Blackrock for her last two nights in Ireland before travelling on to Slovakia. She toured some of the sights in Dublin and I brought her to her former home in Temple Cottages near Dublin City centre (click here to see a map of where this is - Temple Cottages should be at the centre). She didn't remember the street very well, but we went into Comiskey's Pub which is around the corner from Temple Cottages for a jar. Evelyn got talking to some of the locals (she wasn't a bit shy), some of whom remembered the Byrnes and Mrs Ruddle (next door). Evelyn very much enjoyed herself talking to them all. It is a sad time for the Canadian side of the family as Geoff Edwards, Mum and Evelyn's brother-in-law also passed away this week after a short illness. He was married to Mum's sister Patsy (Cathy to the Canadians) who died several years ago. I don't recall ever meeting him though Mum says he and Patsy visited Ireland in the 1960's. God be good to both Evelyn and Geoff. Kind words, Eugene. Angie & I flew to Toronto from our home in Victoria, BC to attend Aunt Evelyn's funeral. It was a tough sad week for the family here in Canada. Hope you & family are all well. Hello you do not know me, but I often visit this site about your aunt Evelyn. We foster her two dogs for her, Sarah and Benji. We really love them, and it is funny you get to know someone if you care for their pets. She sure trained and loved these two dogs. I tell them she loves them still, and feel we are loving them for your aunt. We feel she is an angel here in our home. I feel a real bond with Evelyn even though we never met on this earth. Teresa , London Ontario. Hi Teresa - and many thanks for your kind comments about Evelyn.